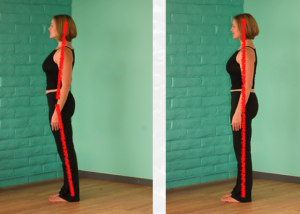 When we think of "good posture" we often think "shoulders back" but when we do "good posture" we're not really pulling our arms back as much as we are pushing our pelvis forward. Our shoulders back has become pelvis forward. This doesn't seem like a big deal, I know, but from a mechanical perspective, your alignment can be significantly altered (up to 30° in some places! ), which means the performance of your body is significantly altered. The habit of "pelvis forward" is a major contributor to musculoskeletal issues like foot pain, chondromalacia of the knees, low bone density, pelvic floor disorder, and sacroiliac pain...just to name five of the most common ailments in the United States. Ideally the major axis of the body should form a plumb line, to minimize torsional forces that cause joint degeneration (ankles, knees, hips, lumbar and thoracic spine) and maximize structural support (weight over the dense heel bones instead of plantar fascia and forefoot). Vertical positioning also places the weight of the upper body directly over the pelvis, which makes the hip joints weight-bearing. Let me say that again. 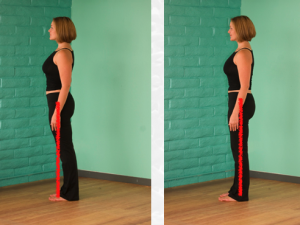 In order to have weight-bearing hips, you must have vertical alignment. No vertical alignment, no weight-bearing hips. Hmmm. Where have we heard we need for "weight-bearing exercise" before? Why do we need weight-bearing exercise? Oh, right. Because without it, our bone density decreases. But here's the thing. Weight bearing exercise does not mean using weights or resistance training, but carrying your body weight in a weight-bearing fashion. You want to build bone density? Get your hips over your ankles and your torso over your hips. And then walk around a lot. Walking in alignment is the most naturally osteogenic (bone building) thing you can do! Take a look at this posture. How does it look to you? Now, adding a line through the ankle, knee, and hip joint, see how this posture compares to vertical alignment! How does an anterior pelvis contribute to foot health? Drawing a vertical line from the center of mass (located in the pelvis) shows, pretty clearly, the difference in weight placement over the foot. On the left, the burden is great on the forefoot (front of the foot), overloading tiny muscles that should be concentrating on supporting the arch of the foot - not the weight of the body. This weight on the front of the foot can contribute to plantar fasciitis, hammertoes, metatarsalgia (pain in the base of the toes), and neuropathy. A quick fix: Get your weight back where it belongs! It's easy, fast, and free. You may also notice that you can't do this with a positive heeled shoe on. Shoes with any heel automatically forces the pelvis forward. Barefoot, try getting your weight far enough back to lift your toes off the ground. Now you have a sense of your weight being over your heels! What about bone density and low back pain? The lines should help you see the "physics" of this posture. When we think of weight we usually think of how much we weigh (which seems right, right? ), but weight is really how much of your mass is being pulled on by gravity. The gravitational force works in a vertical fashion, and points straight down to the ground. 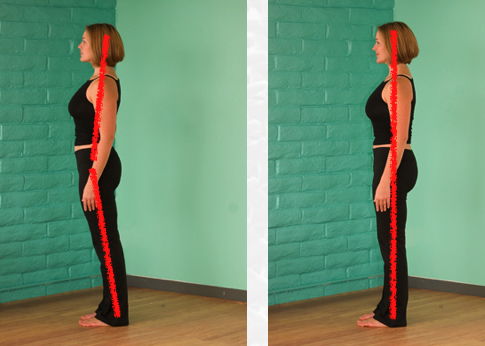 So, if a vertical line from your torso to the ground passes through a lot of air (like the picture on the left), then the weight of the torso is not felt by the bones of the legs. 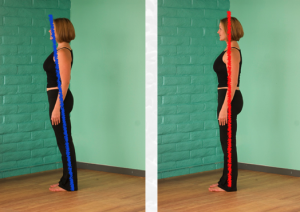 If a vertical line travels from the torso through the legs, that means the leg and pelvic bones experience the full weight of the torso.The mass is the same, but because weight is a vertical force, the less vertical you are, the less you "weigh," from the standpoint of your legs, hips and pelvis. Back pain? The constant forward-motion of the pelvis relative to the backward-motion of the torso create lumbar compression, which increases friction, heat, osteoarthritis, and ultimately disk degeneration. Solution: Vertical Alignment. Got it? If you're a pelvis thruster, backing your hips up (so they are in a plumb over the knees and hips) will feel like you're sticking your bum out. Get objective about it first. What you "feel" and what "is" are two different things. I just read a great quote from yoga teacher Jeffrey Lang. Your Natural may not be your Neutral. Brilliant. The purpose of my Biomechanical Model of Preventive Medicine is to help you restore your proprioception (knowing where you are space) to a time before you had thoughts and beliefs and habits. Feel like your booty's sticking out? Get used to it. One more thing, the reason you have moved the pelvis forward in space has more to do with the tension in the muscle and myofascial patterns of the upper body, but, we can't adjust the "vase" until we have the table straightened out! Tomorrow, I'll continue with how a forward thrusting pelvis + pregnancy can decrease your birthing mechanics. Back that thing up, will ya? PS. Last day to register and save $25.00 on my No. More. Kegels. online course! For more info: http://www.restorativeexercise.com/2010/no-more-kegels. View recorded exercise sessions if you can't attend the live course! Six lecture sessions (start as soon as you register) and 4 exercise sessions available daily for a month, beginning in August.